You can stop the account notice by uninstalling your current version of Office, and then installing the version that comes with your new plan. Be sure to install the version of Office that comes with your new plan as soon as you can. If you don’t, you will eventually see Unlicensed product errors. Your new Office 365 plan might come with the 2013 version of Office, the 2016 version of Office, or both. 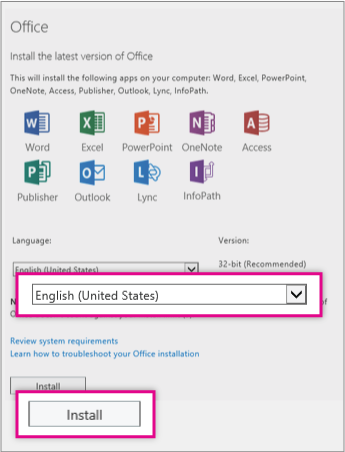 Depending on which version of Office you install, some apps, such as Access, might not be included. For information about what features are available across Office 365 plans, see Office feature availability across Office 365 plans. Use Control Panel to uninstall Office, as described in Uninstall Office 2013, Office 2016, or Office 365 from a Windows computer. After Office is uninstalled, sign in to Office 365 at http://portal.office.com/OLS/MySoftware.aspx. Note To install the 64-bit version, choose 64-bit in the Version section before you choose Install. If you’re uncertain, try Choose the 32-bit or 64-bit version of Office for more information. Select Run or the equivalent depending on the browser you’re using. When you see “You’re good to go,” select All done. Tip After installing, you can start to use Word, Excel, and the other Office applications. If you can’t find the applications, learn how to find the Office applications that you just installed.